[Posted at 1:12 p.m.] Witness Jordan McLaughlin told CNN affiliate KYW that firefighters arrived at the site just minutes after the collapse. "(The building) collapsed the wrong way, and it landed on a thrift shop" that had people inside, he said. "It was scary. What happened next was a I dropped my stuff and I tried to help people out." He said he helped two people out of the rubble, and others assisted a few other people in the first 10 minutes or so. After that, first responders asked him and other non-emergency personnel to leave the area. "When the building collapsed ... there (were) people standing on the corner that (were) right next to the thrift shop. The building ... had really big aftershock on the ground. You felt it shake. There (were) people that actually fell over. People started screaming. They ran across the street. "There (were) people inside the building. You heard them scream. Then we (Jordan and others nearby) went over to the building. We said, 'Can you hear us, can you hear us? Say something.' And we tried to find the people." [Posted at 12:52 p.m.] “This is an active search and rescue. It’s ... delicate and dangerous.” Philadelphia Mayor Michael Nutter told reporters. The Salvation Army store had “workers and customers” at the time of the collapse, so it is difficult to know exactly how many others are trapped in the rubble, he said. [Posted at 12:40 p.m.] A four-story building that was being demolished apparently fell onto a smaller building with a Salvation Army store in central Philadelphia at about 10:45 a.m. Wednesday, injuring and trapping a number of people, Philadelphia Fire Commissioner Lloyd Ayers said moments ago. Two people are still believed to be trapped beneath the rubble, and emergency personnel are trying to extricate them, Ayers said. Twelve people have been taken to hospitals, he said. The 12 injured people either have minor injuries or are in stable condition, he said. [Posted at 12:31 p.m.] Witness Ari Barkin said the set-for-demolition building that fell onto the thrift shop was about three stories tall. The taller building used to house an adult bookstore, he said. 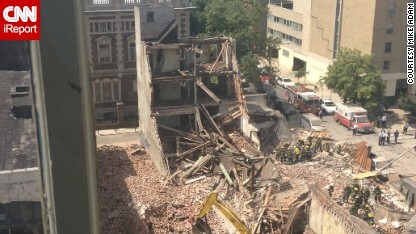 Witness Jordan McLaughlin told CNN affiliate KYW that the collapse made the ground shake, and some near him fell over. [Posted at 12:15 p.m.] As many as 10 people are believed to be trapped following what officials say was an accident at a demolition site in Philadelphia Wednesday morning, city Fire Commissioner Lloyd Ayers said, according to CNN affiliate WPVI. A witness, Ari Barkin, told CNN that a part of an unoccupied building set for demolition fell onto a one-story Salvation Army building. Debris also hit three cars and a sidewalk, he said. Another witness, Jordan McLaughlin, told CNN affiliate KYW that a number of people were in the Salvation Army building, and that he helped pull two people from the rubble. The Occupational Safety and Health Administration has been told it was an accident at a demolition site, and it has investigators on the way, representative Leni Fortson said. The collapse happened in the Center City area, at 22nd and Market streets, WPVI said. Jeff Frank (R-Kansas) "Right Wing Insanity"
Did a terrorist interfere interupt the business of the demolitiin contractor? I went there at the demolition spot, walking with my friend, Caroline at about 10:00 pm. It was dark and men were working very late. I wondered, why is it so dark? The alleged building allegedly fell allegedly down and allegedly smashed another alleged building. Supposedly.